Introduction video to the series about Dr. Klim’s approach for the new patient interview and exam for those inquiring about discretionary care. Setting the emotional stage so the patient senses comfort and safety is imperative and the "backbone" to this appointment. Part I: New patient interview video I introduces Dr. Klim's concepts about a successful welcome environment and setting the atmosphere for patient trust and safety. Part II: New patient interview video II role plays the one-on-one interview process. 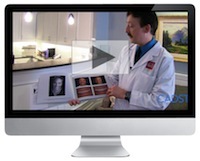 Part III: New patient interview video III demonstrates the power of enrolling patients using oral photographs. New Patient Video series found in Chapter 9.